Built with comfort in mind, the PB Basic Upholstered Pet Bed provides your furry family member a finely crafted and softly cushioned spot to rest. Available in a choice of two colors, this stylish bed is designed to complement your own decor. Hand made of washable, waterproof velvet. Silver stainless steel legs. Comfy and durable, the Victoria Pet Bed is crafted with a solid-wood frame and a thick cushion. With its classic design featuring molding details on the wood, turned feet and soft upholstery along all sides, this bed looks stylish in any room. The removable slipcover is machine-washable to make clean-up a breeze. Comfy and durable, the Jaclyn Pet Bed is crafted with a solid-wood frame and a thick cushion. With its airy trellis design, this bed looks stylish in any room. The removable slipcover is machine-washable to make clean-up a breeze. With its chic two-tone design featuring paneled sides, the Bernard Pet Feeder looks stylish in any room. Stainless steel bowls and a hardwood frame make it durable and easy to clean. Comfy and durable, the Bernard Pet Bed is crafted with a solid-wood frame and a thick cushion. With its chic two-tone design featuring bun feet and paneled sides, this bed looks stylish in any room. The removable slipcover is machine-washable to make clean-up a breeze. Soft and durable design. Made from comfortable, stone-washed fabric. Playful bone motif Channel liner insert is made of high loft Memory Fiber. Memory Fiber keeps pets elevated from cold floors and provides joint and pressure point relief. Channel liner insert is made of high loft Memory Fiber. Memory Fiber keeps pets elevated from cold floors and provides joint and pressure point relief. This versatile Burrower Blanket offers your dog lots of ways to get comfortable: they can curl up on top of it (using it as a sleeping mat), snuggle up next to it, or crawl in and burrow inside it. The light cream side is embossed with a subtle dog bone print, while the interior is a darker tan color. Sherpa fleece on both sides offers maximum softness. In cream. Washable. Our microsuede dog throw blanket boasts supersoft faux suede on one side and our exclusive non-shedding FleeceLock on the reverse. It's designed for the dog who could use a little extra warmth, a dose of added softness, and snuggle-ready comfort in their dog bed or on their favorite chair A comfortable den for your dog, this unique Burrower Bed satisfies your dog's natural sleeping instincts. Being den animals, dogs prefer to sleep in a cave-like dwelling where they feel safe, secure, and protected. They crave the overhead coverage, a supportive place to lean, and a soft sleep surface, making the Burrower Bed a dog's dream. Thick side bolsters offer support, a soft cover creates a cozy cave, and the center mattress is padded for maximum comfort. The top props open on the front (for easy access), and rests flat against the back (to seal off the den-like dwelling). An air vent in the back ensures ventilation. This bed is ideal for dogs who like to sleep under the covers or dogs who prefer a snuggly and secure place to burrow. A handle makes this lightweight bed easy to travel with or move from room to room. Polyester. Washable. Extremely durable, and equally good-looking, the furniture-grade twill fabric and faux-leather trim set the Orvis platform dog bed apart. The ComfortFill cushion promises not to flatten or clump, and features a chambered liner that keeps the polyester fill evenly distributed—ideal cushioning for dogs who like to nuzzle in to get comfortable. The Orvis ComfortFill 2-in-1 Dog Bed is the ultimate in versatility and comfort. Our newest silhouette is designed to keep all dogs comfortable, no matter their shape, size, or sleep style. 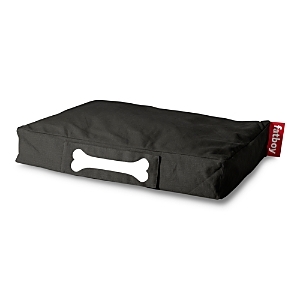 The plush, polyester-filled bolsters on four sides offer your dog an all-around sense of safety and security, as well as back support and a place for him to lean into or rest his head. The incredibly soft and comfortable original Orvis Dog's Nest has remained a customer favorite since we introduced the dog bed to America in 1976. Our spun-polyester ComfortFill cushion is springy and plush, and refuses to flatten or clump—perfect for dogs who like to dig, nuzzle, and nest as they settle in for a nap. A deeply cushioned sleeping area and a higher bolster increase your dog's comfort and sense of security. It's a combination your dog will find blissfully inviting. Our velvety-soft quilted microfiber cover with piping along the bolster edges looks as good as it feels. The incredibly soft and comfortable original Orvis Dog's Nest has remained a customer favorite since we introduced the dog bed to America in 1976. Our spun-polyester ComfortFill cushion is springy and plush, and refuses to flatten or clump—perfect for dogs who like to dig, nuzzle, and nest as they settle in for a nap. A longtime favorite, our Deep Dish Dog Bed style sports a handsome, streamlined shape with a plush bolster. It's a design that looks great in any home. See alternate views for personalization thread colors. Handsome, stylish, and supremely comfortable. What more could you, or your dog, ask for? Boasting traditional plaid prints, this great-looking pillow bed is sure to complement your personal style. The knife-edge construction is finished with faux-suede brown cording, and the cushy bed is stuffed with spun polyester that refuses to clump or flatten Refresh your dog's bolster bed with a new Orvis AirFoam microfiber cover. Our quilted furniture-grade cover, featuring faux leather piping, is durable and supersoft. A water-resistant liner keeps the foam clean and dry. All dogs will find comfort and therapeutic benefits in the warmth and support offered by a thick cushion of memory foam engineered specifically for them. The breathable water-resistant liner keeps the cushion clean and dry. Our durable microfiber cover resists pet hair and dirt without compromising its luxurious feel. See alternate views for personalization thread colors. A longtime favorite, our Deep Dish Dog Bed style sports a handsome, streamlined shape with a plush bolster. It's a design that looks great in any home. See alternate views for personalization thread colors. A deeply cushioned couch-like sleeping area and a higher bolster increase your dog's comfort and sense of security. It's a combination your dog will find blissfully inviting. Our velvety-soft quilted microfiber cover with piping along the bolster edges looks as good as it feels. See alternate views for personalization thread colors. Accidents happen. That's why this Memory Foam Bolster Dog Bed with snap-off pads is perfect for senior dogs, puppies, and dogs recovering from surgery. When your dog leaks or the pad gets dirty, simply unsnap the sleep surface and toss it in the wash. A longtime favorite, our Deep Dish Dog Bed style sports a handsome, streamlined shape with a plush bolster. It's a design that looks great in any home. See alternate views for personalization thread colors. Give your dog a friend that talks back with these plush squeaker dog toys. Soft and durable, non-toxic and hypo-allergenic toys are gentle on teeth and gums. Machine washable. Farm Buddies Squeaky Toy promises constant entertainment and companionship for your dog. Attention-grabbing squeakers in the plush corduroy arms, legs, and belly invite play, while the durable Tuffut Technology™ construction and the internal reinforced seams make sure this tough toy can keep up with the most rambunctious of pups These plush animals promise constant entertainment and companionship for your dog. Knotted limbs invite gnawing and chewing, while the durable Tuffut Technology® construction, and the internal reinforced seams make sure these tough toys can keep up with the most playful of pups. This bundle of 3 tough stuffed woodland critters is perfect for games of tug-o-war. The animals run the zoo. What will your dog do? Made by dog people, for dogs and their people, backed by BARK’s Happiness Guarantee. Your dog will get endless hours of entertainment out of this cute and cuddly duck toy. Constructed of a plush-ribbed-polyester fabric with a hidden squeaker, it will keep your best friend occupied, while the soft yet durable fabric stands up to hours and hours of playtime. In olive Built for carrying, wrestling, nuzzling, and snuggling. Made of a soft yet long lasting polyester spun fleece, this plush bone absorbs the smell of your pet, ensuring a special bond. Washable. Durable, machine washable tote bag with BARK Bounce pattern. It’ll fit everything your dog needs for their next walk in the park, made by BARK. Made by dog people, for dogs and their people, backed by BARK’s Happiness Guarantee. Durable, machine washable tote bag with BARK Dalmatian pattern. It’ll fit everything your dog needs for their next walk in the park, made by BARK. Made by dog people, for dogs and their people, backed by BARK’s Happiness Guarantee. This 4-panel combo system can convert from a gate to a pen. The beautiful hardwood gate includes a locking door panel that helps you pass through the opening with ease. You don't need to move the entire gate. Each panel locks in place at 90º or 180º to provide extra stability. Durable and easy to use, the One-Touch Pet Gate is the best way to keep your pets out of harm's way. Mounted in your doorway, the gate opens in both directions with a simple one handed locking latch. Rubber stoppers protect walls and molding, An elegant new look in dog gates, this Deluxe Freestanding Mesh Dog Gate features a rich wood frame with an antiqued bronze finish mesh to keep dogs where they need to be. Specially-designed walk-through door that opens in both directions and says open at 90 degrees to allow the dog to freely move from one room to another when allowed. Our Zig-Zag indoor wooden dog gates are an easy and great-looking way to protect your dog from dangerous areas in your home. Simply unfold and stand up to create a barrier just about anywhere. Each two-panel section covers a three-foot span. If your dog is prone to chewing on wooden gates, this is the solution. Similar in design to our popular Wood Door Frame Gate, this wide metal dog gate is crafted in wrought iron. This versatile, 3-sided, free-standing dog gate features support feet that allow you to position it in a variety of shapes. Make a straight gate, a zig-zag barrier, or stand it against a wall to form a crate. Folds neatly for easy storage. Our Convertible Elite Mesh dog gate is the perfect answer for all your gate and pen needs. The gate is available in 4 or 6 panels with a lockable gate and each of the panels can be locked at 90 degrees or 180 degrees to create either a gate or a pen depending on your immediate need. In antiqued bronze. This beautiful hardwood 6-Panel Gate/Crate Combo can be used as a room divider, zig-zag gate, or a crate. Includes a 25½" lockable door for easy pass-through. Each panel locks in place at 90° or 180° to provide extra stability. It's a gate, it's a crate, it's a room divider! This convertible three-in-one product is designed to safely confine your dog and to look great in your home. One of the six panels includes a lockable door that allows you and your family to move about easily throughout the house. Each stabilized panel locks in place at 90-degree and 180-degree angles. Great for growing puppies. Leave this dog crate folded in your vehicle's cargo area—it's sturdy enough to pile groceries and sports equipment on top. When you need it, just unfold it. This folding dog crate features a hinged door on each end, a flip-up top door, and a large swing-up garage-type side door that slides back under the top. The heavy-gauge plastic top holds up to 100 lbs. ; plastic sides and bottom feature rounded corners to protect vehicle and home interiors. We designed our durable, water-resistant hammock seat cover specifically for the dirtiest dogs. Crafted of heavy-duty polyester, the protective hammock features a water-resistant coating on both sides to ensure that no moisture gets through to your vehicle's upholstery. A grippy, slip-resistant surface on the bottom keeps the hammock in place This upgraded design of our customer-favorite seat protectors increases canine comfort and doesn't distract from the hammock's main job of keeping dirt, sand, and water off your car seats and floor. The Orvis lightweight folding travel dog crate easily collapses for storage and travel, making it ideal for your home, destination, and for use in your car. Not recommended for puppies or dogs that chew. As rugged and reliable as your tried-and-true field jacket, this durable cotton twill hammock seat protector from our Field Collection features a cotton corduroy sleep surface that keeps your dog comfortable on the way home from a long day on the hunt. Make your backseat safer and more comfortable for your dog with the firmness and security of our microfiber-covered foam backseat extender. Sized to fit easily into the footwells of the backseat of most cars and SUVs, this travel accessory prevents your dog from slipping down between the front and rear seats. The design of this microfiber dog hammock allows it to capture loose dirt and sand before it can end up on your car seats and floors. Installing is a breeze: simply hook it to the front and rear headrests. The design of this microfiber seat saver allows it to capture loose dirt and sand before they can end up on your seats and floors. Height-adjustable headrests are required for installation. Keep your backseat looking like new with this quilted microfiber dog seat cover. Features slits for threading seatbelts through. Height-adjustable headrests required for installation. Our thirsty polypropylene mats are designed to keep your floors clean throughout the worst that any season or dog can dish out. Great for entryways, mudrooms, or high-traffic areas inside your home or outside of it. Made in USA. These legendary mud, water, and sand-tested Water Trapper floor mats complement any home décor with their woven-lattice basketweave design. Tough polypropylene construction makes them suitable for indoor or outdoor use. Made in USA. This thirsty polypropylene Water Trapper® floor mat effortlessly takes the worst that any season can dish out, and the oak leaf motif makes this mat perfect for welcoming the outdoors into your home. Hardworking thick fibers scrape off mud and snow, thin fibers remove moisture from the soles of boots and shoes, and side channels drain water quickly. Our thirsty 'Diamonds' polypropylene Water Trapper™ mat effortlessly takes the worst that any season can dish out. Used in high-traffic businesses and the hotel industry, these heavy-duty doormats are perfect for the busiest areas of your home. The tri-denier fiber system protects your floors, thanks to extra-thick fibers that scrape off mud and snow and thin fibers that wipe away moisture from the soles of boots and shoes. Add a personal touch to your entryway with this hardworking welcome mat. Our thirsty polypropylene mats effortlessly take the worst that any season can dish out. Used in high-traffic businesses and the hotel industry, these heavy-duty doormats are perfect for the busiest areas of your home. The tri-denier fiber system protects your floors, thanks to extra-thick fibers that scrape off mud and snow and thin fibers that wipe away moisture from the soles of boots and shoes Add a personal touch to your entryway with this hardworking Water Trapper welcome mat in our popular oak leaf motif. Our thirsty polypropylene mats effortlessly take the worst that any season can dish out. Used in high-traffic businesses and the hotel industry, these heavy-duty doormats are perfect for the busiest areas of your home. The tri-denier fiber system protects your floors, thanks to extra-thick fibers that scrape off mud and snow and thin fibers that wipe away moisture from the soles of boots and shoes.